In this day and age pretty much every business needs to be online. That said, we personally handpicked a collection of the best construction WordPress themes for you and your company or brand. Whether it is an international corporation or a small local business, your online presence is a must nowadays. Bear in mind, everyone will browse your company name on the world wide web, and if they will not find a website, people will get skeptical. It is just the way it is. More and more companies are getting online and so should you. While it could get really expensive to create a company website back in the days, today, things are darn cheap. 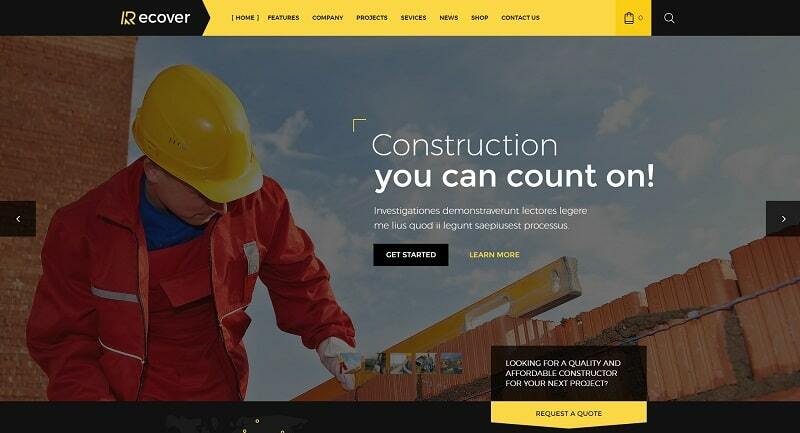 By picking one of the premium construction WordPress themes for a very affordable price, you can get your brand on the web in a matter of minutes. It’s as easy as pie. And to make it even more effortless, we created this collection of the best themes that we will update with new ones on a regular. No need to look any further, pick those who you like, check the demos and if it suits your needs it can be yours straight away. Bringing your company on the web can not only show your professionalism but gain new business, too. Let it be on the global base or local, build a website once and for all and start ranking for those highly searched and targeted keywords. Those are the ones that will bring in new traffic and sales. The sooner you start ranking for your niche keywords and putting out quality content, the better your search engine position will get. And the better your search engine position, the more $$$. No matter what construction industry are you into, there is a theme for that. With an attractive website and proper optimization for your niche, you can grow awareness for your services and products relatively quickly. Don’t sit on it, it is time for a change. The amount of exposure you can get (for free) can be enormous. The only thing you need is to browse the top construction WordPress themes, pick your favorite and jump on the internet. A website can be your online business card and will open new doors to success. Write articles about your own business, industry news, post testimonials/reviews and create an excellent user experience. But first, tell people what you do and let them know you are the best at it. With a new theme and a little effort, you can stand out from the crowd, grow loyalty and new trustworthy customers. 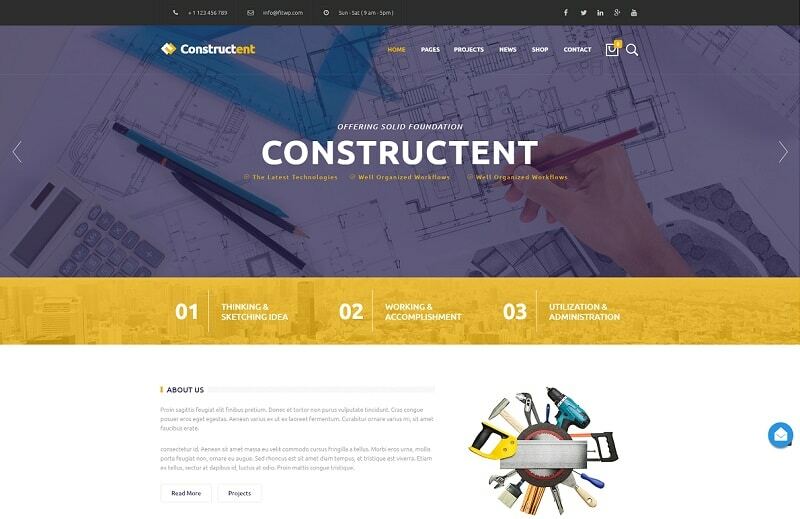 Anyone who is after building a website in the construction niches, look no further, Constructo is a theme you might consider picking. It allows it’s users to create beautiful and fully responsive websites as easy as possible. With only one click, you can install the demo, customize it and you are ready for the launch. Yep, it is that easy. Its full responsiveness will allow new and old visitors to enjoy your page on any device. 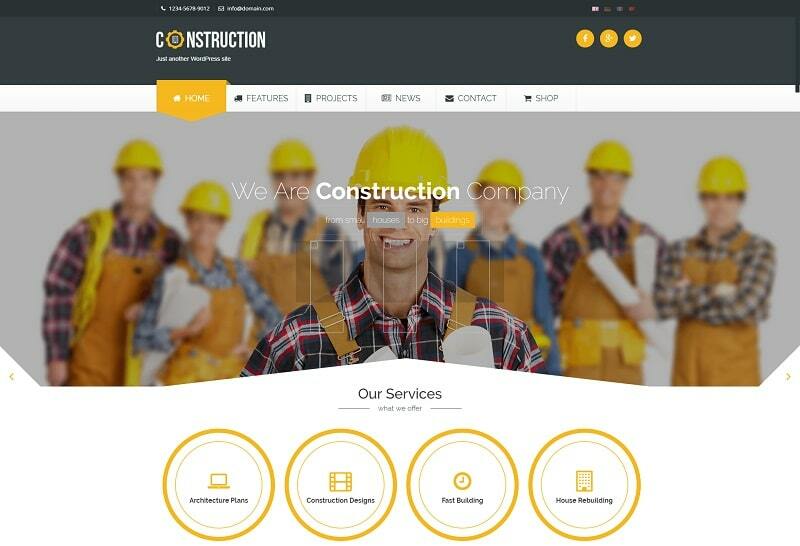 Start building and creating an outstanding web presence with construction WordPress themes. While it is designed mainly for construction and building companies, Constructent can be used for other business as well. Its wide customization options allow you to build your website the way you fancy. It is fully responsive, meaning, it works fluently on any device, and compatible with WooCommerce. In case you sell goods, integrate WooCommerce to your site and create a beautiful online store. Not only is Constructent user friendly, but it is also search engine friendly. That said, having an SEO optimized website can bring in a ton of new business. A business theme created especially for construction and renovation purposes. 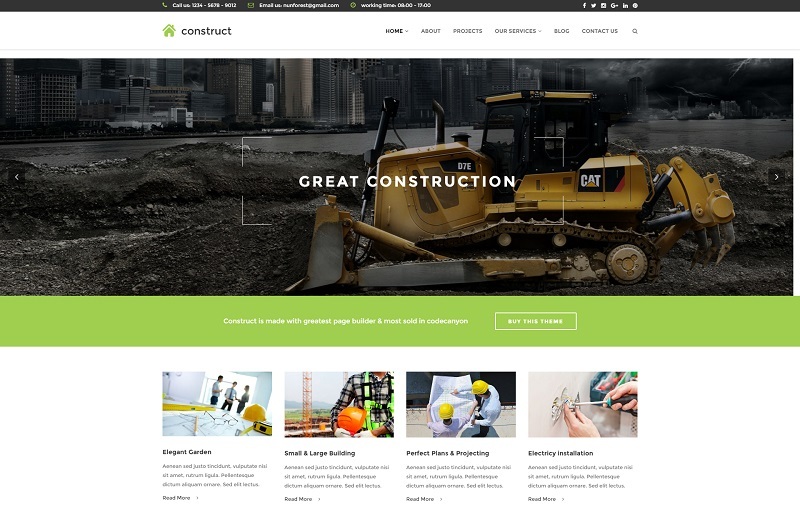 If you are in the building business space and offer either physical work or other building services, Construct is the WordPress theme that will have everything covered for you. Without much work needed, you can have a website up and running for your company in a matter of a few clicks. You can simply pick any of the predefined demos, add your logo and information and you are pretty much good to go. Save on time when it comes to building your website, rather focus on building your business. Needless to say, The Bridges will help you build a solid connection between your clients and your amazing building services. This construction WordPress theme features a fully responsive and retina ready design that will help you attract site visitors right away. It is perfectly suitable for all kinds of business, like architecture, engineering, building services and more. It is also compatible with WooCommerce plugin what allows you to build a stunning web shop. 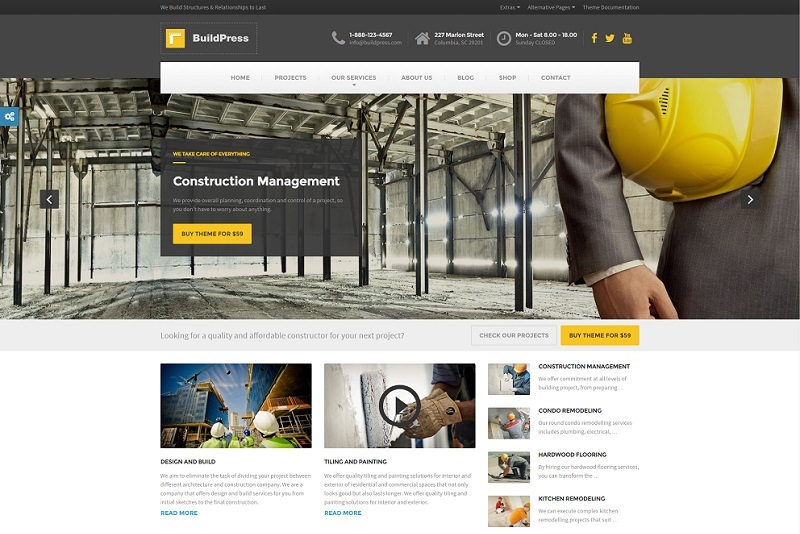 Build & Design WordPress theme is designed to support the construction companies and architects. The theme allows the users to share their latest construction project, the projects in hand, construction services offered by the users. The biggest asset of the theme is that it is equipped with the “Quotation form”. This quotation form allows the customers to contact with users with the request for the quotation. Project Portfolio – flaunt the different projects the user has participated in. This can be done in the form of gallery of construction images. 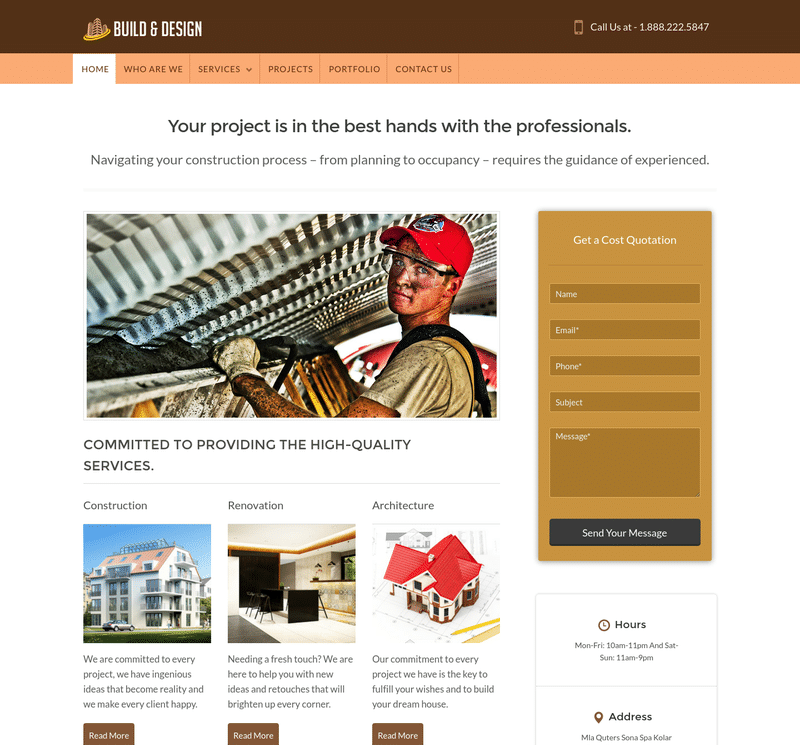 Builder WordPress theme is built for all contractors, tradesman, civil engineer, architecture etc. This OnePage template can be easily used to manage vendor and trades contact along with the customer records. It has got sections which will let you demonstrate your recent work through a video, services you offer and your team of experts. 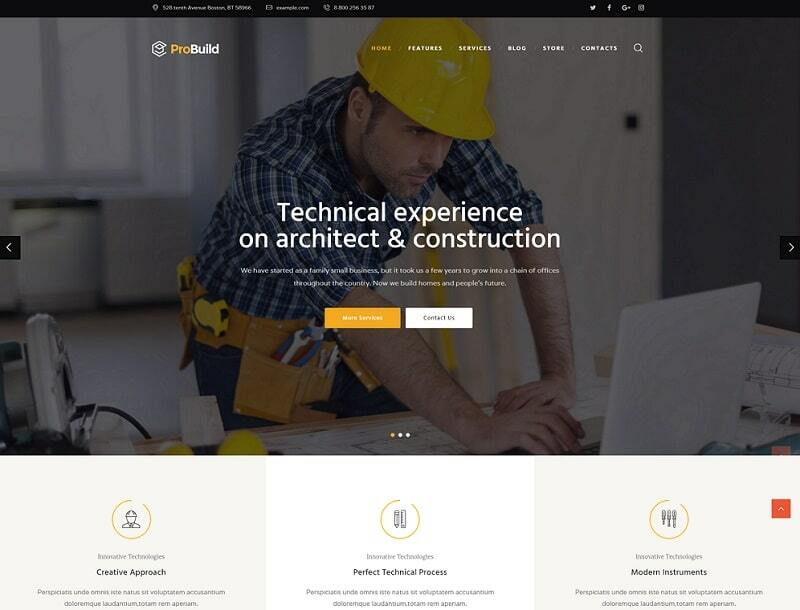 From architecture and plumbing, all the way to remodeling services and construction companies, ProBuild WordPress theme fits all these businesses perfectly. Built and designed to feature your amazing work and help you promote it on the world wide web. It offers various unique homepage layouts, is fully responsive and will look beautiful on all the retina-display ready devices. Moreover, it is compatible with the WooCommerce plugin which allows creating an online shop where you can sell building tools, equipment and other. 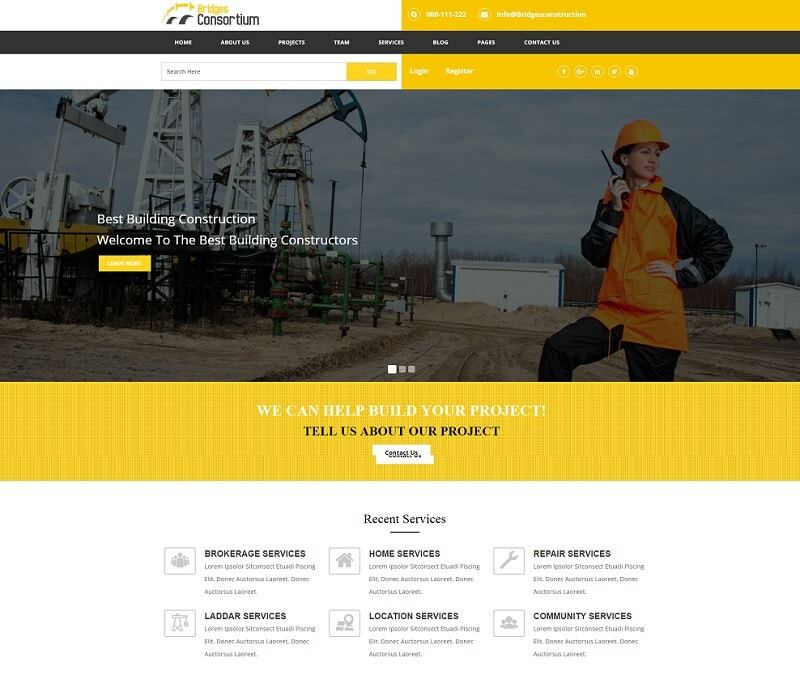 A fully responsive theme perfect for architecture, cleaning services, building services, engineering and other construction related services. Works beautifully with just about any type of small business. Let it be decorating, plastering, carpentry, plumbing and any other business activity, with Construction theme, you can get online with ease. Whether you are a complete newbie when it comes to creating new websites or an expert, this theme will fulfill all of your needs. Add opening hours, appointment form, a Q&A and you are good to go. Of course, don’t forget to write about your amazing projects and let visitors know that you are the best at it. 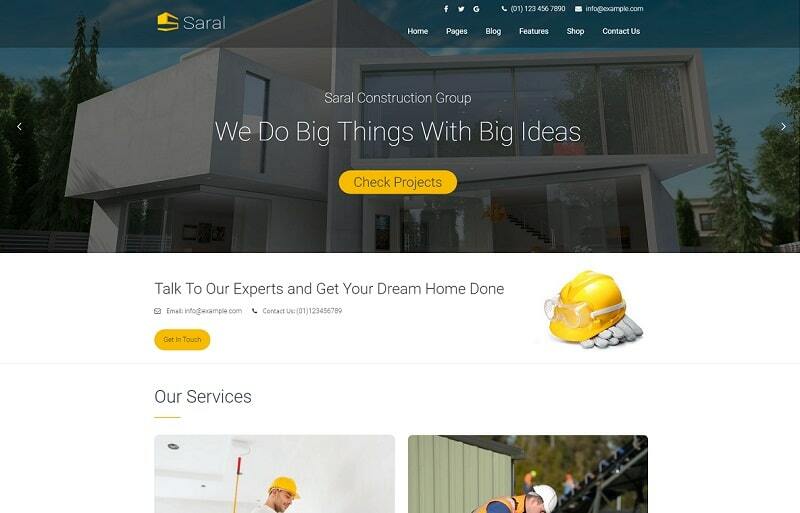 Nothing should truly hold you back when you decide to pick Saral construction WordPress theme to be the theme of choice for building your business website with. It is super easy to work with and follows all the modern standards, meaning, your professional website will work on all the devices and fit any screen. Are you offering engineering, architecture or any other construction or building services? Look no further, Saral Construction is meant for you. 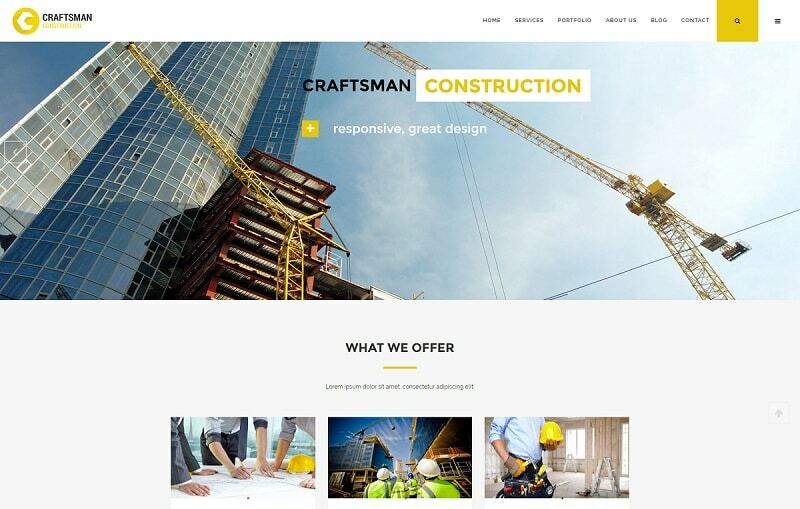 With Craftsman Construction you can easily setup a website for your niche business, like craftsman work, painting, construction, handyman, repair business and a ton others. Its fully responsive design that works on all mobile devices and desktop and easy setup can get you online in no time. This teme comes with such extra features like calculator, testimonial, blog, projects feature and more. Pick from any of the existing headers or customize preferred ones to your needs and take your visitors’ breath away. With its drag and drop page builder, you can easily create your site to the way you and your customers/visitors like it. No matter which device your visitors use for web browsing, Construction looks beautiful on all of them. 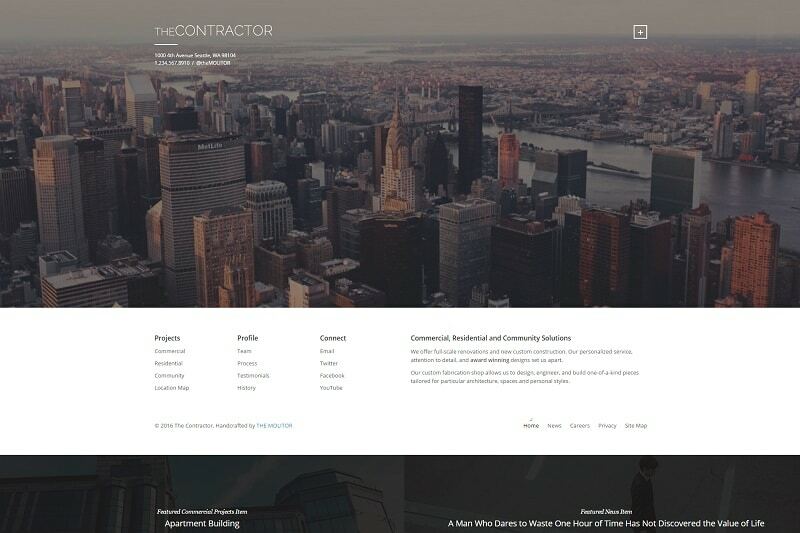 An easy to customize and use, yet professional, WordPress theme for business and construction companies and services. Either you are in corporate, engineering, interior, painting, renovation or any other niche, Construct helps you bring your business online in the most beautiful way. More importantly, in the way you like it. Customize every section of your new website and make every user’s experience an unforgettable one. Whether you need it for professional use or your creative masterpieces, Structure theme covers you with everything. Its responsive and retina ready design is perfect for your web page to look beautiful on any device. 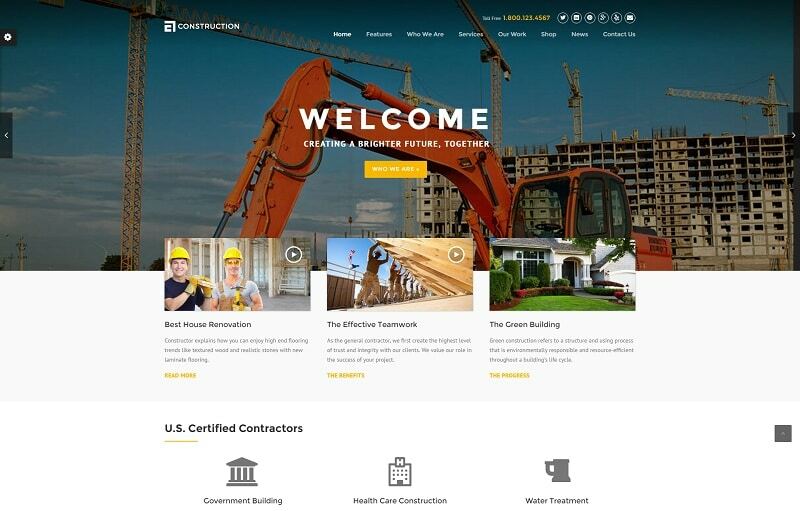 To bring your building service company on an entirely different level, use the countless benefits, Structure has to offer and build a unique website. With the advantage of the drag and drop option, you are able to create that perfect website quickly. A little imagination, quality content, amazing photographies and you are ready to start closing new deals. 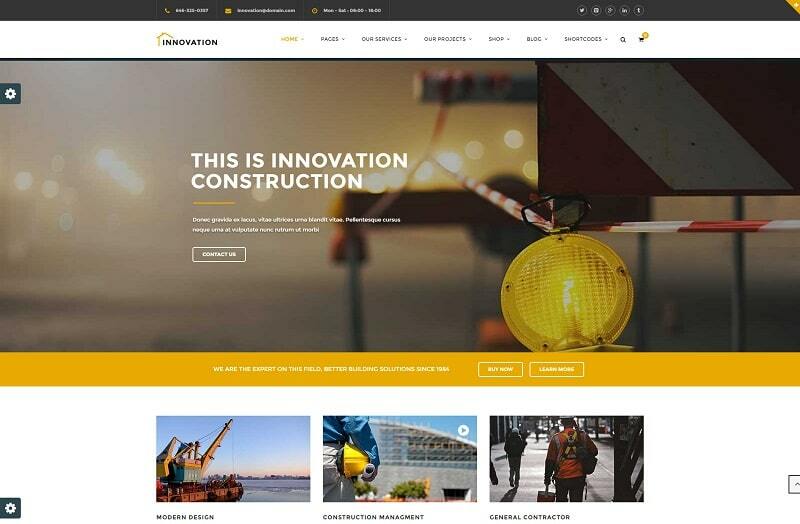 At Construction, staff wanted to create a simple, yet very professional looking construction WordPress theme. Not to mention, simple to use without much (or at all) coding required. Build your page with Visual Builder, use demos, predefined home pages and color schemes and you are just a step away from your site’s launch. It works magnificently with building and construction type of businesses and works fluently on any device. Let it be a smartphone, tablet or desktop, Construction WordPress Theme will fulfill your requirements. 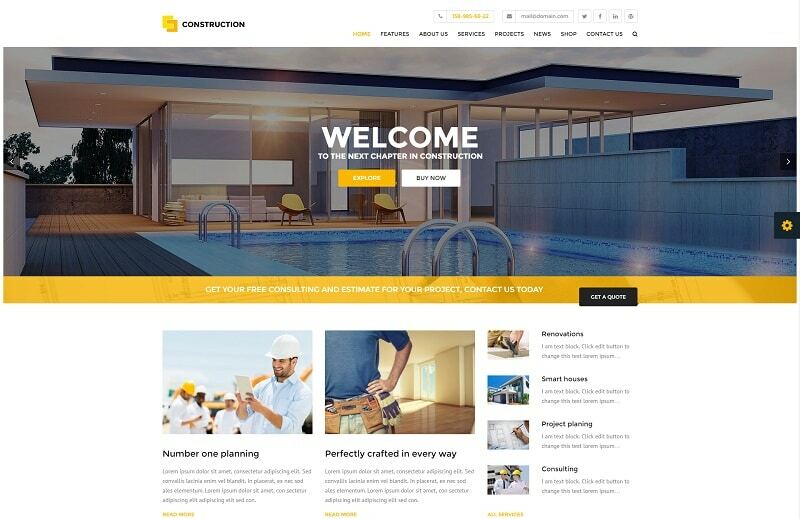 You are only a few clicks away from creating a smart, modern and simple website for your construction business. It allows you to create a unique experience for each and every visitor that gives your website a visit. Using its benefits, you can get online quickly, without any coding experience. That said, you can continue to focus on the main thing – building your business. No need to give it a second thought, BuildPress can easily be your pick for your building or construction business. 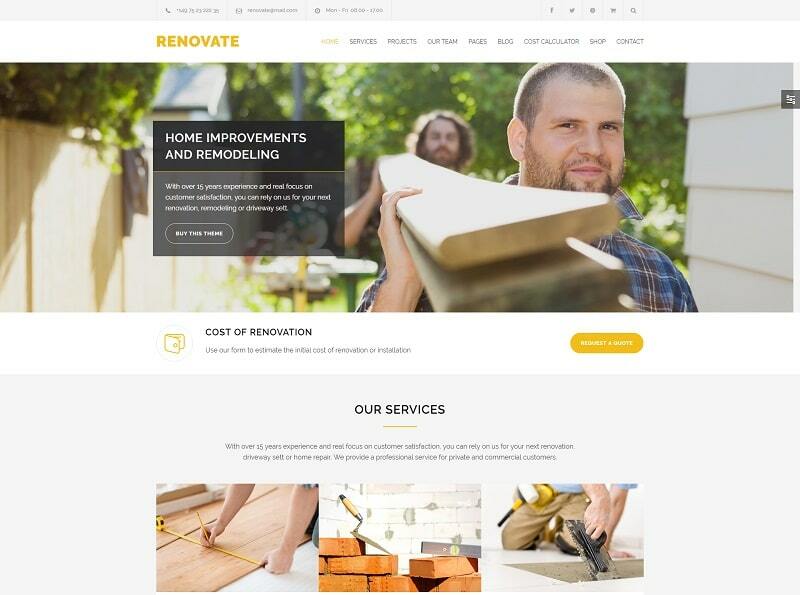 If you are in the renovating business, this responsive and retina ready WordPress theme is one you should put focus to. 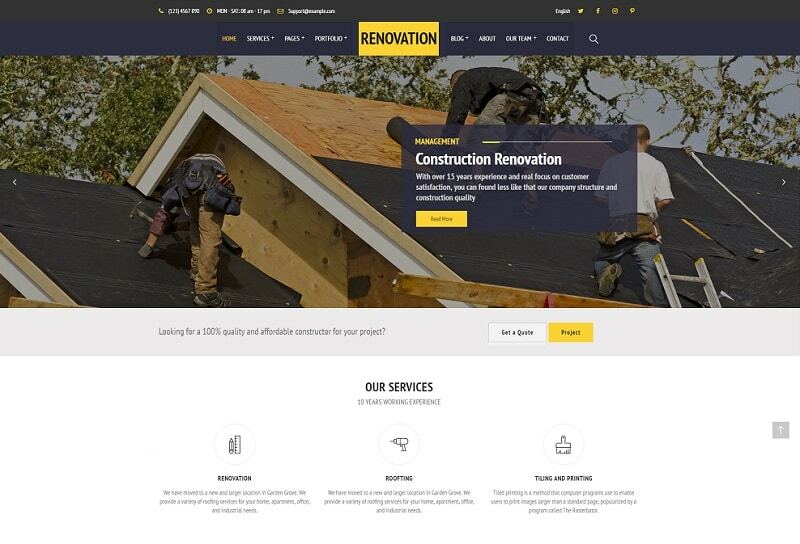 Whether you are a big company, a small company or an individual, with Renovate, you can bring your business online. When online, you get a chance to spread your name amongst a wider audience, meaning, more potential business. To make the process of building your website fun and easy, Renovate comes with all bunch of goodies. Revolution Slider, Page Builder, ajax contact form and cost calculator are just a few of the features that will help you get online within minutes. 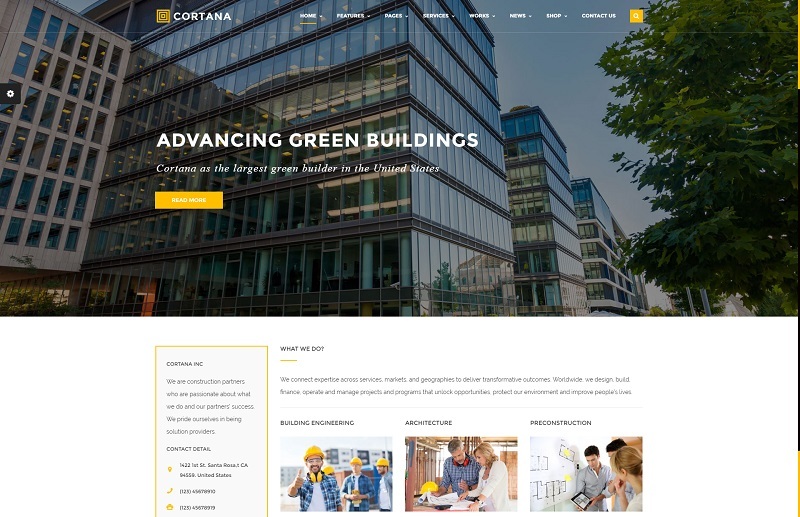 A construction WordPress theme that can be easily used by anyone, Cortana, is fully responsive and SEO optimized. Meaning, you have a good chance to easily rank for that focus keyword your company is all about. With its responsive design, theme works beautiful on all devices – mobile and desktop. Building a website with Cortana is super simple. With all it’s features and included premium plugins, you get a chance to create a business website with ease. Don’t be intimidated, you need no coding skills to make it happen for your company. 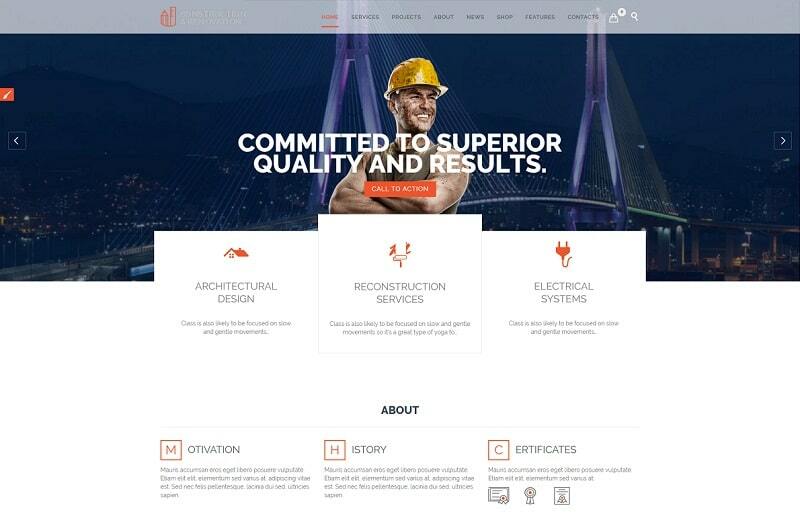 Fully responsive and SEO optimized WP theme that was designed specifically for any kind of construction and building companies and/or services. It also suits perfectly for businesses like car repair, plumbing, craft factory, warehouse, logistics and others. Recover WordPress theme offers more than 300 theme options, allowing you to create your website the way you like it. Building a website never felt easier. Compatible with WooCommerce – create a customized online shop! 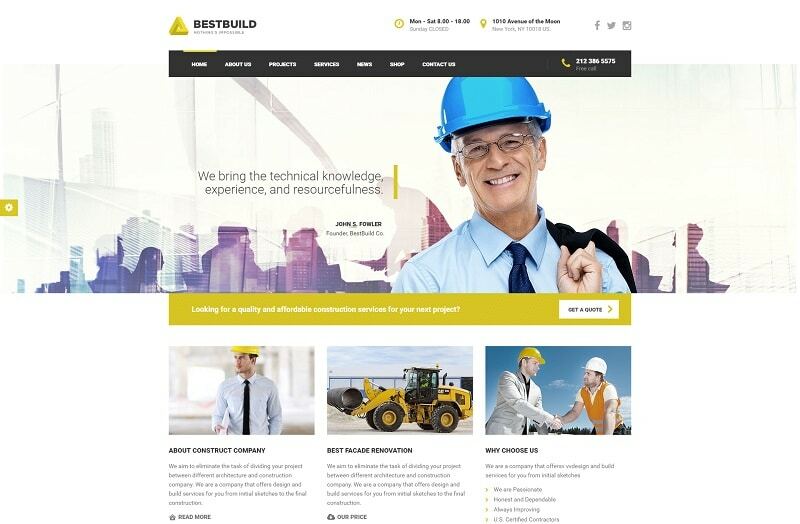 Designed specifically for architecture, building and construction companies, BestBuild is easy to use theme that will help you make your business stand out from the crowd. Visual Composer allows you to put your site together with the drag and drop page builder. While it may sound complicated, it does not require any coding skills. You put the pieces together, add your company’s touch and you are ready to go. New business opportunities await! Retina ready and fully responsive theme that suits building, construction, heating, painting and other business perfectly. It is easy to customize and allows you to import demos with only one click. A customizable calculator will help your visitors get a quote in an instant. With all its features, you will find ReConstruction theme simple to use. That said, your business can be online in mere minutes. 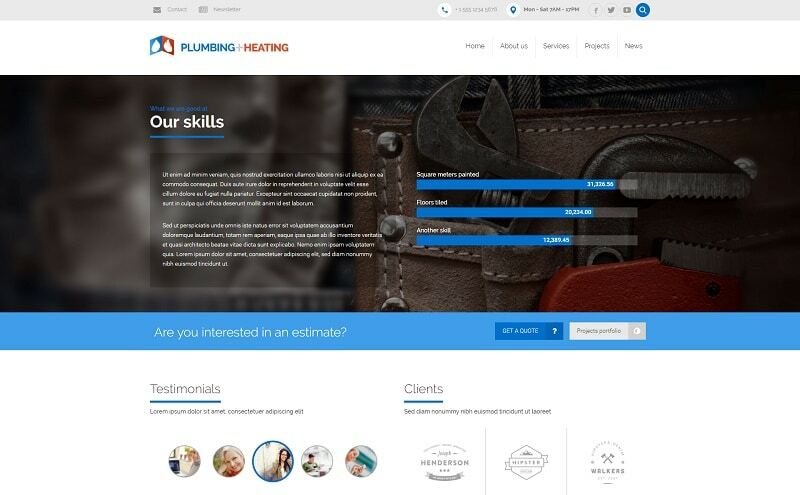 Obviously, this theme was designed specifically for plumbing businesses and companies. However, it still fits any kind of home repair and business website, too. 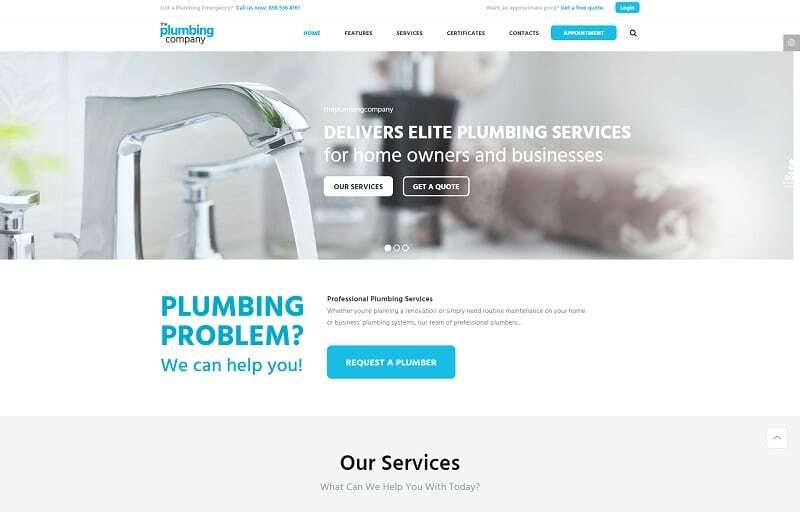 And if you are an individual, Plumbing WordPress themes can be your choice as well. With its easy to use and customize approach, you can create a unique website that showcases your business and services in the most attractive way. Not to mention, with WooCommerce integration, you can also create a web shop, selling products that suits your niche. 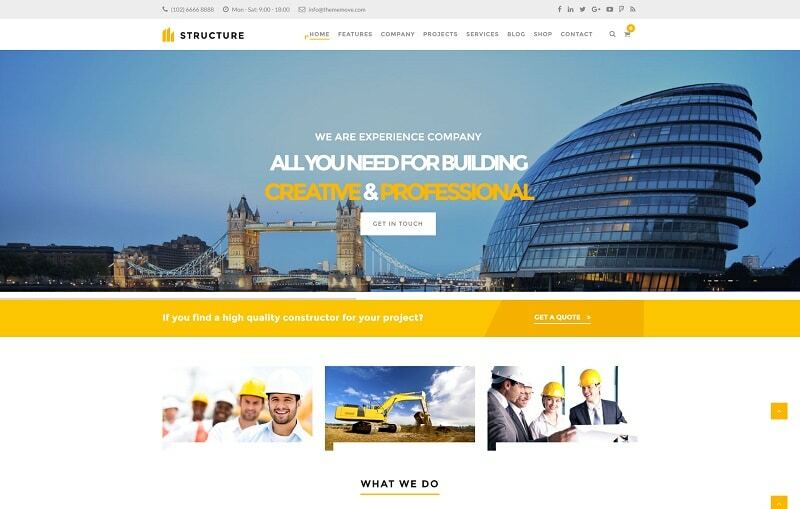 An elegant and modern construction WordPress theme that matches perfectly with any kind of construction company, architecture and other niche businesses. 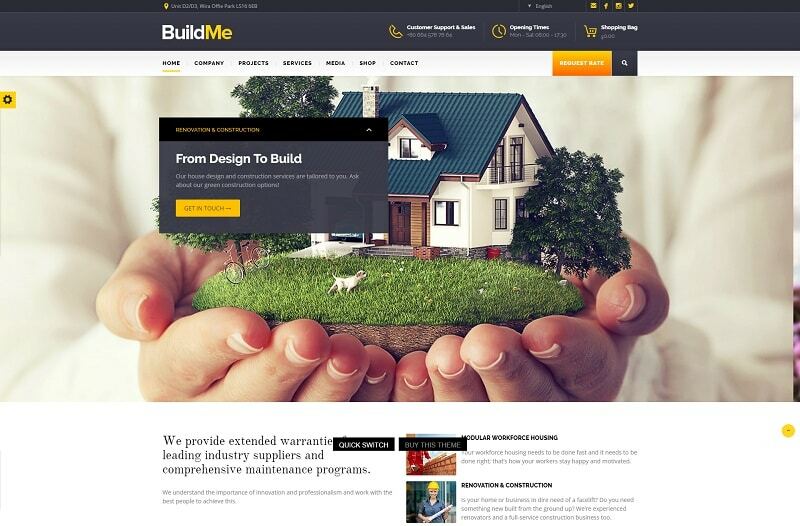 However, since BuildMe is fully customizable, you can use the theme for nearly any kind of website. It is very simple and user friendly, meaning, you can build a website completely on your own, without hiring a coder. With the drag and drop option, you can effortlessly create your website to your likings. Add the features you want your site to have and you a pretty much done. 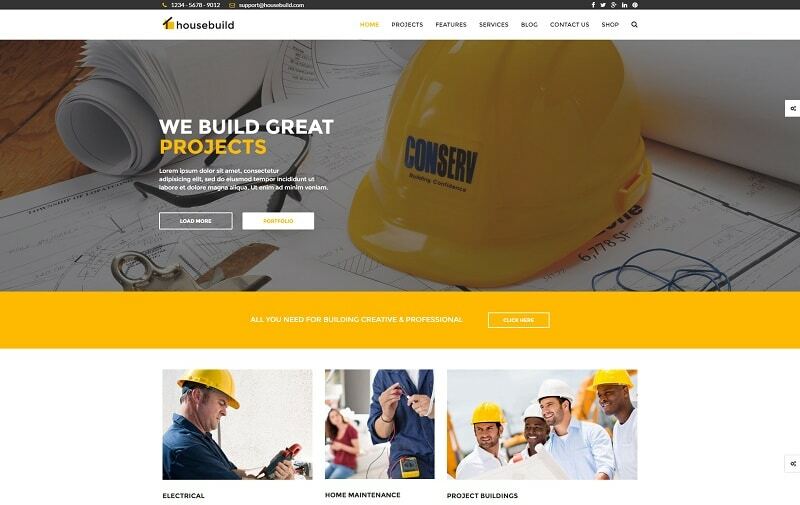 With Housebuild theme you can create a simple, yet modern, website for your business and company. It fits perfectly niches like building, electricity, engineering, interior, painting, renovation and many more. While the final product you create looks very professional, the theme itself is very easy to use and super customizable. Make your website stand out and the kind you and your visitors and potential clients will love. With any of the construction WordPress themes that you find on this list you can create a website with ease. Construction theme that is specified for building and architecture is no different. With its powerful admin panel and Live Customizer, you can create a new website within a matter of minutes. Yes, it actually is that easy and quick. Specifically created for the construction and architecture companies, The Contractor is very simple to use theme that focuses on simplicity. With the built-in features, you can build and customize your business’ webpage fast and easily. 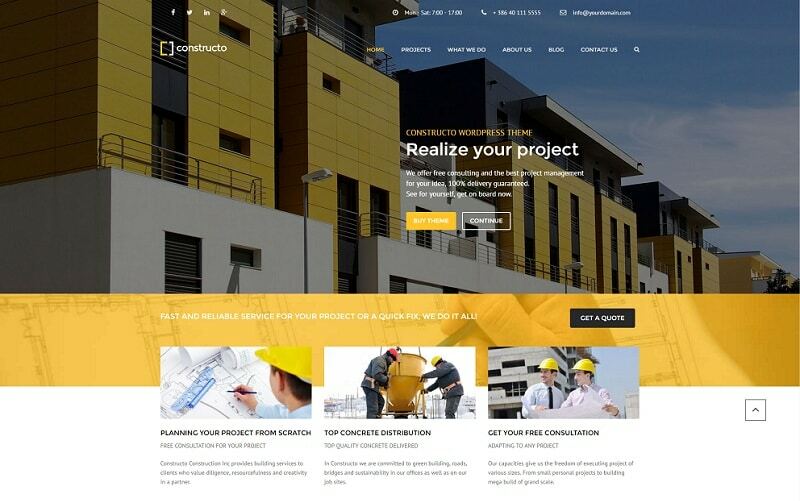 Construction and building WordPress theme for everyone who likes flexible possibilities and unlimited customization. Innovation theme also comes with predefined layouts for the quickest and easiest website creation. Install the demo with one click, make changes to whatever you fancy and the website is finished. Whenever you are in need of a change, you can effortlessly change features and update your site. With Photo Gallery Portfolio Plugin, it has never been easier to showcase and update your construction portfolio. There are no coding skills required, however, the final product will look like of a true professional. Your online presence should be fine and polished just like your work is. Moreover, at the same time you update your portfolio, it automatically publishes your project to the Sp8ce.Design. A marketplace where construction professionals gather, share their extraordinary work and get hired for new projects. With this extensive list of construction WordPress themes, you are a step closer to bringing your business online. Worldwide web allows you unlimited exposure for your company, meaning, you are up to seal numerous new deals. Build an eye-catching website and allow visitors, new and old clients, to have an extraordinary experience.